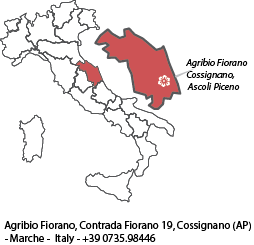 The ORGANIC FARM HOLIDAY B&B FIORANO is in the South of Le Marche region, Ascoli Piceno (AP) province, just 15 km from Adriatic sea and beaches (BLUE FLAGS 2016), in one of the most beautiful area of the region. It is an old farmhouse (second half of 18th century) recently renovated with a technology of biobuilding and respects the architectural features of the old house, that overlooks the wide estate of vine yards and olive groves of the farm, 2 km away from the medieval town Cossignano. 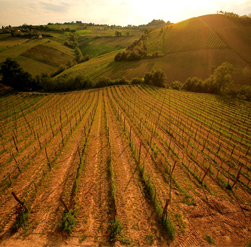 The position of agriturismo biologico Fiorano is perfect to visit the beautiful Marche region. Rooms and apartment with B&B treatment available. The most important part of the house is the wide vaulted hall with a fireplace obtained from the old stables where breakfasts and meals are served. In summertime, breakfast is served under the wonderful arcade where it is possible to relax. In the house there are for guests a fridge, everything to repair mountain bikes (the structure is a Bike Hotel ) and a lot of brochures about the territory and tourism. Free WIFI Internet connection. Tennis, fishing and running and cycle paths are available in the area. The covered public swimming pool is in Grottammare 13 km away. Horse-riding school at 3 km. There is a wide choice of cheap and good restaurants close by. . Close to Cossignano (2 km) are facilities including post office, chemist, food shops, a butcher, restaurants and an organic bakery. Small pets admitted subject to agreement only in the flat. No smoking in the rooms. In the house it is possible to organize tasting of the estate’s products of wine, olive oil, jams, cold meats and salamis. It is also possible to organize meetings and courses. Apartment and rooms with breakfast treatment. Family management. We speak English and French. The agriturismo was completely restored (2004) using environmentally sympathetic construction techniques which respected the architectural features of the old building. The beamed and tiled roof was built incorporating a natural ventilation system for greater summer comfort in the attic space, thus avoiding the unhealthy and ecologically unsustainable use of air conditioning. Particular attention was paid to the choice of materials: wood was used for the reconstruction of the structural elements of the ceilings, the architraves and the porticos and it was treated using a completely natural wood stain and protector. All the floors are in reclaimed terra-cotta. The internal and external fixtures and fittings are made from hardwood. Cork panels were used in the roof and wall insulation while the internal and external plaster and painting are constituted from natural lime to guarantee the maximum benefit and health of the building. The carefully planned electrical system, the solar panels both for heating the water and the underfloor and wall central heating, the proper disposal of refuse and the use of products which respect the environment, the use of renewable energy from an energy company, all demonstrate the low environmental impact of the building and the farm . The project of the garden was done following special attention in using bushes and trees that need low water and saving water with special cistern for rain and automatic irrigation. Since we are committed to the protection of the environment, we encourage the guests to ask for new towels only if required and to drink the special tap water coming from Sibillini National Park (one of the best water in Italy). We set in 2010 a Roof Integrated Photovoltaic System for electricity production ( among the first ones in Le Marche) that ensure 13.900 Kw/year production and almost completely cover the energy need in agriturismo and in the winery. In this manner we avoid the emission of 9,1 ton/ year of CO2. We believe in renewable energy and in a “green sustainable agriculture“. 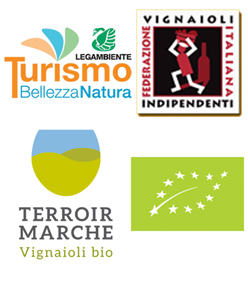 For our commitment to environmental sustainability we received the Quality Isnart Label, the Legambiente Turismo Ecolabel and the acknowledgment of Marche region.